The concept of cryptocurrency can be tough to grasp. How does Bitcoin work is often the first question people ask themselves. In this article, we offer our explanation. The first attempts at securing communication through methods of cryptography can be traced back thousands of years. From an Egyptian scribe in 1900 BC obscuring their hieroglyphs to Phil Zimmerman’s 1991 release of the PGP (Pretty Good Privacy), the maintenance of privacy has always been an important consideration for humankind. In the 1990s, a network of coders who referred to themselves as “cypherpunks” banded themselves together. They circulated their work on a mailing list through which they provided each others’ code with feedback and built upon each other’s ideas. The release of encryption tools like PGP came at a time when governments were introducing mass surveillance. The retrieval of information was becoming easier due to the widespread adoption of electronic communication systems and the onset of the information era. Cypherpunks aimed to safeguard communication and transactional exchanges. As part of that dream, they dedicated themselves to creating ways to perform anonymous monetary transactions. They wanted their innovation to lead to the invention of an anonymous electronic form of money. Through that dream to create an independent, safe and accessible system to transact electronic money, Bitcoin was founded. 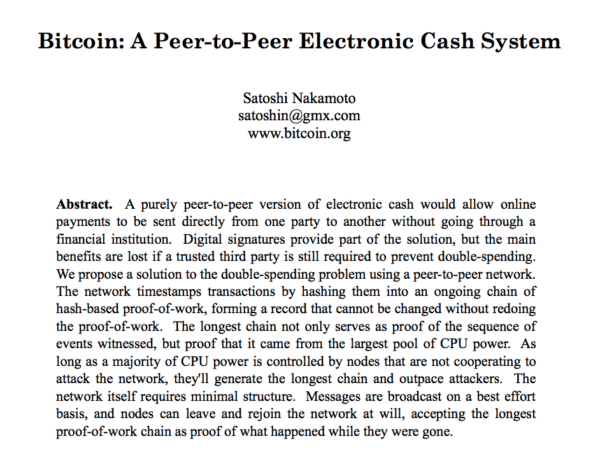 The proposal for “A Peer-to-Peer Electronic Cash System”, also known as the Bitcoin whitepaper, was released on the cypherpunk mailing list in October 2008 by an unknown person or group named Satoshi Nakamoto. The Bitcoin whitepaper culminated the various efforts undertaken by cypherpunks to create privacy-oriented digital payment solutions. The identity of the mysterious Satoshi remains unknown but we’ve covered theories about who created Bitcoin elsewhere. Bitcoin emerged at a particularly crucial time when people around the world had lost faith in their governments’ central financial authorities. People needed to know that there was an alternative out there, an alternative in which transparency was secured and prioritized. Satoshi’s Bitcoin whitepaper filled the vacuum of hope by presenting a new type of financial system that did not rely on a third party. It laid out foundations for a transparent, anonymous, decentralized peer-to-peer network in which consensus-driven algorithms validate irreversible Bitcoin transactions. There is no physical representation of bitcoin. The exchange of value using the cryptocurrency takes place online and there is no central authority involved in its issuance. Bitcoin has a limited supply of 21 million coins and that supply is influenced by the network’s participants. As of early 2018, over 17 million bitcoin had been generated. There are mathematical mechanisms in the Bitcoin protocol that help to maintain its supply and manage its value over time. The finite supply of bitcoin likens it to gold. Their value is derived purely through the laws of supply and demand, meaning how much people engage with it determines its price. Bitcoin’s scarcity was incorporated into the protocol to retain its value in the long run. Alongside its decentralized, transparent and privacy-oriented nature, bitcoin’s scarcity is another key feature that distinguishes it from fiat currency. For example, the supply of Euro has increased by 5% every year since 2015 and such increases do not have an end in sight. While bitcoin’s price certainly demonstrates high volatility as it eases into the global financial system, its controlled supply directly contrasts to fiat currencies’ ever-increasing supply, which has contributed to the prevalence of economic crises. Bitcoin has inspired a truly borderless payment system. It promotes financial inclusion by allowing anyone with Internet access anywhere in the world to transact value. It has created a pathway for the two billion people around the world who do not have access to bank accounts to enter the global market. The technology underlying Bitcoin is called blockchain. The Bitcoin blockchain is an open source, decentralized distributed ledger. In simple terms, it’s like a real-time public registry/database. Any can download the blockchain on their computer and become part of the network of nodes. Once downloaded, the entire transaction history since the Genesis Block (the first block in the Bitcoin blockchain, mined in January 2009) is visible. All processed Bitcoin transactions are recorded on the blockchain and those records are immutable. The system runs through a peer-to-peer network of nodes. The nodes act simultaneously to validate transactions and ensure the security of the network. There is no central node and thus, no central point of failure. That makes the public Bitcoin blockchain more secure than private blockchains. The network manages itself with the collective computing power of miners who make the network of nodes with its proof-of-work driven, consensus algorithms a reality. Bitcoin challenges the inherent weakness associated with trust-based transaction models. Rather than relying on trusting a specific institution, Bitcoin and its underlying blockchain technology employ cryptographic proof-of-work solutions to ensure the chronological verification of valid transactions. The Bitcoin blockchain contains unique timestamps and ownership data to ensure that every transaction broadcasted to the network holds cryptographic proof of ownership, which avoids double-spending of the same coins. The data (string of numbers) that represent bitcoin cannot be duplicated after it’s initially spent because transactions are stored simultaneously on the blockchain. Participants who maintain the network are called miners. Each miner stores the entire Bitcoin blockchain on their computer. Since all, by now thousands, miners retain a copy of the same history, it’s impossible to change or corrupt the blockchain. The chronological chain of blocks records not only the new transactions verified to or form the new block but also the entire transaction history of bitcoin. That ensures a very low chance of data corruption. Additionally, an attempt to attack the network would require an almost unattainable amount of computing power. The computational improbability of overriding the Bitcoin blockchain is what makes it immutable. Bitcoin’s introduction of blockchain technology has sparked a wave of innovation in many sectors and has found unanticipated use cases. Blockchain technology can be employed beyond the finance sector to improve transparency, security and remove intermediary bodies across the board. For example, its slow introduction is already seen through the concept of smart contracts, within governance, the sharing economy, the management of supply chains and files, data storage and more. Furthermore, blockchain technology can play a crucial role in the global fight against corruption. In one easy-to-remember phrase, mining is the process of adding new blocks to the Bitcoin blockchain and the generation of new bitcoin. Mining induces a lottery-type situation, which ensures that no one person or group of people can control what block is next included in the blockchain. Bitcoin miners form a crucial element of the Bitcoin network. Active miners attempt to mine the next block in the chain by using their computing power to run mathematical, algorithmic calculations relating to Bitcoin transactions. When a solution is found, a new block is added to the existing chain and a hash is generated, which undergoes verification by the other nodes. A hash signifies the encrypted proof-of-work solution and confirms the validity of transactions. Approximately every ten minutes a new block of transactions is validated by the miners. Mining is a difficult process that purposefully involves the use of large amounts of electricity resources as a mechanism to cap the number of blocks mined per day. 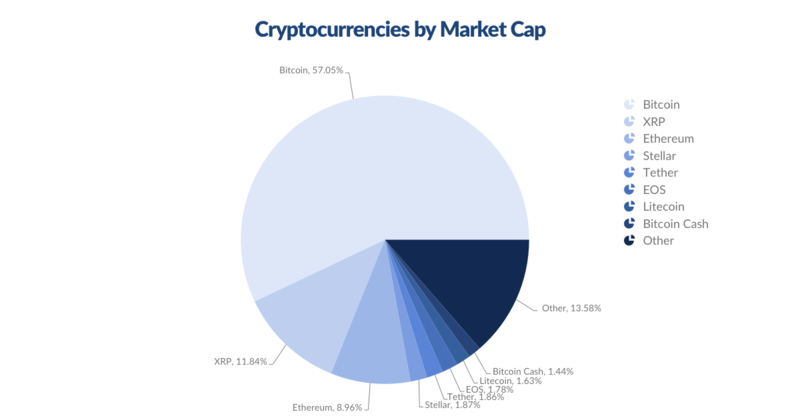 See coin.dance for more statistics on the Bitcoin blockchain. The statistics above were recorded on July 23rd 2018. Miners are rewarded with a certain amount of bitcoin for the blocks that they mine, as well as the network fees that users pay to broadcast their transaction. The amount of bitcoin received by miners decreases over time as more bitcoin is mined. The first mined blocks of the Bitcoin blockchain created block rewards of 50 bitcoin each. However, Bitcoin’s protocol includes a mechanism that reduces the block reward to steadily limit the amount of bitcoin mined. Every 210,000 blocks (approximately, every four years) the reward per block is halved. This process is called “halving”. Halving is also important because the price of bitcoin has increased significantly over time and it’s expected that it will continue to maintain a high price as scarcity increases. A Bitcoin address is like a traditional bank account number. Bitcoin addresses either begin with a 1 or 3 and look like this 1snowqQP5VmZgU47i5AWwz9fsgHQg94Fa. The difference between bank account number and a Bitcoin address is that a single wallet can have multiple addresses and they do not have names attached to them. Bitcoin addresses can be used multiple times to transact bitcoin. However, it’s recommended to use new bitcoin addresses since your spending behavior can be tracked if you re-use old addresses multiple times. This could happen if someone browsed the blockchain for an address that you used frequently. Thus, for your own privacy, it’s recommended to generate new Bitcoin addresses for new transactions. Bitcoin wallets can hold multiple (often, countless) Bitcoin addresses, which when shared with another bitcoin user fulfill the same role as sharing an IBAN with someone to receive a bank transfer. Bitcoin as a digital currency requires mechanisms of control to ensure the safety of an individual’s coins. This is found through the use of digital signatures. The digital signatures required to perform Bitcoin transactions include both private and public keys. A Bitcoin wallet is where a bitcoin owner stores their coins, however, coins themselves are not actually stored in the wallet. A Bitcoin wallet is the combination of keys. The private key acts as a password and the public key creates addresses to which the user can receive funds. Bitcoin transactions from a wallet will only be executed if they are signed with the owner’s private key. Private keys must be kept secure and secret since they are akin to passwords and help owners to access the bitcoin associated with their public keys. Miners can only verify transactions when they’re signed with the correct private key linked to the coins in question. Every wallet also consists of a public key, which is used to create receiving addresses. A Bitcoin address is the mathematically hashed version of a public key. It’s what you share with people when you would like them to send bitcoin to you. All in all, while there are quite some technicalities behind the formation of these keys and their verification when transacting bitcoin, the difference between a private key and a public key is easy to digest. Share your public key with the public to receive new bitcoin and keep your private key to yourself to retain your bitcoin! There are various different types of wallets that differ in terms of both functionality and security. Bitcoin wallets include desktop, mobile, web, paper and hardware wallets. For now, we recommend that you take a look at this comprehensive guide on cryptocurrency wallets to learn more about what would work best for you. A fork is a split in the Bitcoin network that signifies a software/code update. Such an update creates a new protocol that some developers follow, refine and promote rather than sticking to the original Bitcoin protocol. The Bitcoin network consists of a number of miners that secure the network by providing their computing power to solve mathematical calculations. These calculations enable the consistent addition of new blocks to the blockchain to confirm transactions. A split of the network occurs if a number of miners decide to solve problems based on a new protocol. That results in two blocks being added to the blockchain instead of only one block. Subsequently, the chain of blocks is split and two different chains result, e.g. the Bitcoin blockchain and the Bitcoin Cash blockchain. Other examples of forks include Litecoin, Monero and Ethereum Classic and more. Bitcoin Cash is a cryptocurrency that emerged as a result of a fork of the Bitcoin blockchain on August 1st, 2017. The fork was created following a debate on how to enable more Bitcoin transactions to take place in a faster way and resulted in significant changes to the code in the Bitcoin protocol. Anyone who held bitcoin during the fork received the equivalent amount of Bitcoin Cash if they managed their private key or if an exchange they used supported the fork. Bitcoin has a maximum block size of 1 MB, whereas Bitcoin Cash first had a maximum block size of 8 MB, which has further increased to 32 MB. The increased block size enables more transactions to be processed faster and ensures lower fees compared while the Bitcoin network enjoys greater decentralization due to its higher number of miners. How to improve the way Bitcoin works? Bitcoin has encountered some problems over time concerning the speed and cost at which transactions are processed. Some improvements must be implemented in order to scale the coin in a more user-friendly way. To make changes to the way Bitcoin works consensus must be reached. The practice of consensus within the Bitcoin network makes it a true exercise of decentralised operations. SegWit, short for Segregated Witness, was introduced as an upgrade to the Bitcoin protocol on August 23, 2017. SegWit offers one of many solutions to help with the issue of scaling Bitcoin. The upgrade allowed for the data of a transaction to be split, and for only some of the data to be recorded on the blockchain. As a consequence, up to double the number of transactions could be included in each block and network fees were reduced. However, micropayments still take up quite some space on the Bitcoin blockchain. SegWit eased some problems, but it was not the final innovation in store for the protocol. Solutions were still needed to enhance the speed and cost of Bitcoin transactions. The Lightning Network aims to implement a new layer on top of the Bitcoin blockchain. The additional protocol will allow for direct transactions between two parties to occur off the blockchain. As a result, microtransactions will not be recorded on the blockchain until the payment wave between the two parties is finalized. Thus, the Bitcoin network will enjoy more space to process larger transactions faster and will be able to reduce the network fees. The main improvement enabled by the Lightning Network is instant payments. Accordingly, it’s considered to be the “savior of bitcoin transactions”. Microtransactions will be performed in seconds or even milliseconds with very low or potentially no transactions fees (since miners do not need to confirm these transactions). The security is enforced by smart-contracts without creating an on-chain transaction for individual payments. The introduction of the Lightning Network will empower the Bitcoin network to process thousands of transactions per second. It’s important to consider the difference between the price and value. The price of bitcoin is set by the market under the laws of supply and demand. The price is expected to be sustained in the long run due to its limited supply. The more scarce a resource is, the more expensive it is to buy. At the end of 2013, bitcoin reached a special milestone when its value reached $1,000 for the first time. The currency attracted increasing attention throughout the next years as its price continued to grow and as global media continued to cover stories on bitcoin, especially in relation to the Silk Road marketplace, its discussion in Congress and its popularity in China. 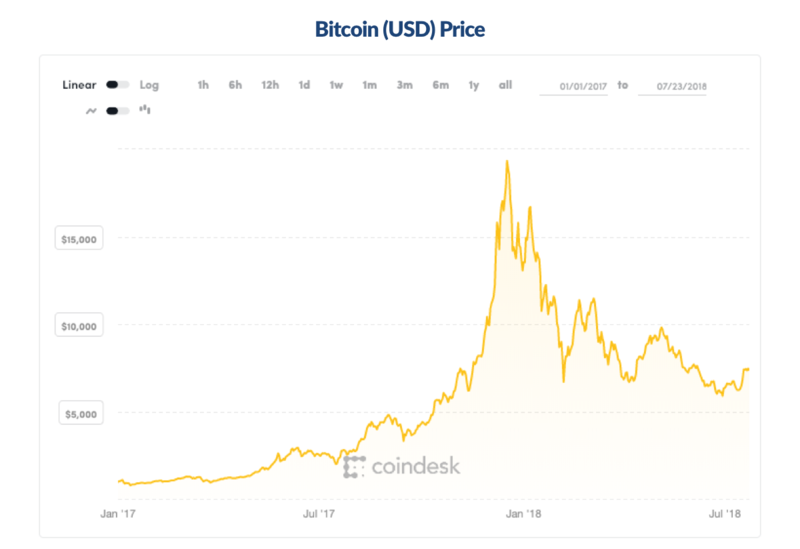 Suddenly, at the end of 2017, bitcoin’s price rose to an unprecedented height of nearly $20,000. Those who were not familiar with the market’s genuine value perceived only risk and began selling their bitcoin to quickly profit and avoid the expected fall. Speculation was rampant and the lack of patience and abandoning of bitcoin assets contributed the dip in bitcoin’s price in the aftermath. Bitcoin needs to settle into the market and take up more space before its more long-term price will be known. Bitcoin is young and as it matures, so will the stability of its price. In contrast, while the price of bitcoin in these early days is volatile, the inherent value of the cryptocurrency is unquestionable. Bitcoin enables the genuinely secure transfer of value internationally. Money is sent around the globe with ease and confidence when performing wallet to wallet transactions. Additionally, transaction fees are often much cheaper than those charged for fiat transfer services. Such functionality is truly valuable in the interconnected, globalized world in which we live. Moreover, once purchased, bitcoin owners are the true owners of their coins. Nobody else can access their coins unless they have access to the owner’s private keys. That produces a previously unknown situation in which individuals hold total monetary independence. Wallet providers cannot spend or loan your bitcoin in the way that traditional banks can with your fiat currency. Furthermore, bitcoin does not suffer counterfeit due to its mechanisms to prevent double-spending. Before bitcoin, a solution to prevent the double-spending of digital currency did not exist. To conclude, bitcoin will live on. Its accessibility and existence are not threatened because it’s programmed to be censorship resistant. Its ever-present value lies in how it’s designed with blockchain technology. The technological foundations of bitcoin offer innovative solutions to widespread issues concerning transparency, security, finance, storage, active citizenship, business solutions and more. Bitcoin and its associated technology have developed a new, first of its kind interconnected, peer-to-peer global web of trust and opportunity. The power of cryptography, the dedication of the community, the use cases and the development of the protocol are how bitcoin has worked to inspire the global financial revolution.